The tall, regal and beautiful raven-haired Maisie Dobbs arrives in London during spring of 1929 to open her own detective agency after having been tutored by a professional psychologist. Her first case has her investigating the daily activities of Celia Davenham, a woman whose husband suspects is cheating on him. Maisie's sleuthing leads her to a far-off cemetery, where Celia spends most of her day mourning a mysterious grave simply marked, "Vincent." After arranging an "accidental" meeting with Celia, Maisie learns that the once-dashing and handsome Vincent had taken his own life after being permanently disfigured during the Great War. Maisie's discovery leaves her pondering her own experiences as a nurse on the front lines. As Maisie ponders the mystery behind Vincent's unseemly death, Winspear takes us back to the years 1910 through 1917 to reveal how Maisie became a detective before volunteering as a nurse during World War I. We learn how Maisie made the transition from a pauper into an educated, respectable, and proper young lady who sacrificed her own well-being to help men in need during the war. It's there on the battlegrounds she meets Simon Lynch, a doctor with whom she falls deeply in love. Readers are left to ponder whether Simon is alive or dead in present day (1929) as Maisie continues to recount a series of tragic events from her past. Near the end, we're meant to learn that Maisie's background actually plays a major role in her solving the mystery behind Vincent's real demise. Maisie Dobbs isn't your traditional cozy mystery. The novel's style is much like Smith's No. 1 Ladies' Detective Agency series and Atherton's Aunt Dimity series. Once you start reading, you'll feel a great calm wash over your body thanks to Winspear's eloquent and serene prose. If war books tend to reach your soft spot, you better keep a box of tissues nearby, because this one could trigger tears and weepiness. I appreciate how Winspear reveals very little about Maisie at first, but keeps you intrigued while slowly peeling away Maisie's layers until you get to her core, revealing an extremely bright and loving woman. I absolutely can't wait to read the rest of the series -- I loved Maisie Dobbs so much I already went ahead and purchased the next three books in the series! There's a lot to take away from this novel. 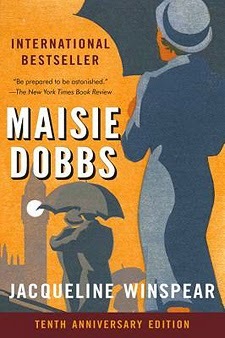 I was pleased to see that Maisie Dobbs received starred reviews from a number of major review publications, was nominated for the Edgar Award, and was the Agatha Award winner the year it came out in 2003. If you've been reading this series, I'm curious as to what you think about it, too! Leave me a comment and share your thoughts!